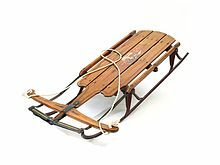 A Flexible Flyer sled, from 1936, within the permanent collection of The Children's Museum of Indianapolis. Flexible Flyer is a toy and recreational equipment brand, best known for the sled of the same name, a steerable wooden sled with steel runners. Flexible Fliers are flexible both in design and usage. Riders may sit upright on the sled or lie on their stomachs, allowing the possibility to descend a snowy slope feet-first or head-first. To steer the sled, riders may either push on the wooden cross piece with their hands or feet, or pull on the rope attached to the wooden cross-piece. Shifting the cross-piece one way or the other causes the flexible rails to bend, turning the sled. Flexible Flyers work best on hard packed or icy snow. If the snow is soft and deep, the sled's runners are likely to sink in and prevent the sled from moving. Samuel Leeds Allen patented the Flexible Flyer in 1889. in Cinnaminson, New Jersey using local children and adults to test prototypes. Allen's company flourished by selling these speedy and yet controllable sleds at a time when others were still producing toboggans and "gooseneck" sleds. Allen began producing sleds in his farm equipment factory to keep his workers busy even when it was not the farm season. He developed many prototypes before he created the Flexible Flyer. The sleds did not sell well until he began marketing them to the toy departments of department stores. In 1915, around 120,000 Flexible Fliers were sold, and almost 2,000 Flexible Flyers were sold in one day. In 1968, Leisure Group of Los Angeles, California bought the S. L. Allen Company. Leisure Group continued to produce Flexible Flyers in Medina, Ohio. In 1973, a group of private investors bought Leisure Group's toy division and started manufacturing the sleds under the name "Blazon Flexible Flyer" in West Point, Mississippi. In 1993, Roadmaster purchased the rights to production and moved production to Olney, Illinois, and in 1998, production was moved to China. As of 2012[update], Flexible Flyers are mostly made in China and some are made in South Paris, Maine by Paricon, Inc.
^ Hatala, Greg (January 7, 2014). "Made in Jersey: Flexible Flyer - The sled from south Jersey". The Star-Ledger. Retrieved 2013-12-22. ^ Bernard Mergen (1995). "Past play: relics, memory, and history". In Pellegrini, Anthony D. (ed.). The future of play theory: a multidisciplinary inquiry into the contributions of Brian Sutton-Smith. SUNY Press. p. 260. ISBN 978-0-7914-2641-8. ^ "Flexible Flyer, king of sleds, slides on". The Boston Globe. 25 December 2011. This page was last edited on 13 July 2018, at 20:50 (UTC).